While there are plenty of drug and alcohol addiction treatment centers throughout Illinois, it can be difficult to know which option would be the best fit. Fortunately, Illinois has a selection of substance abuse rehab centers that offer innovative, quality care. Illinois has a tall history, as it is home to the world’s first skyscraper and three U.S. presidents: Lincoln, Reagan, and Obama. And although Illinois is known for its impressive architecture, its nickname is the Prairie State. As the sixth most populated state in the U.S., Illinois has over 12 million residents – thousands of which are struggling with addiction. In response to Illinois’ addiction issues, the state offers an array of specialized treatment facilities. 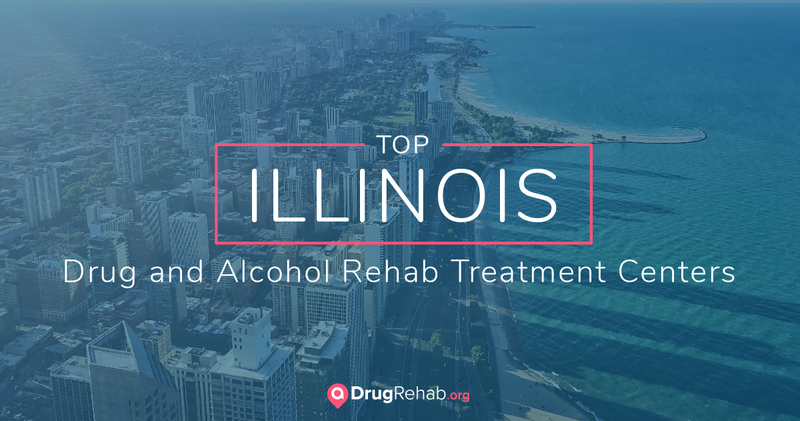 Here is a list of top drug rehab centers in Illinois, ranked for their positive reviews, success rates, amenities and quality treatment therapies. Advocate Addiction Treatment Center offers both mental health and substance abuse treatment through their outpatient treatment facility. With therapies including rational emotive behavioral therapy, 12-step facilitation, and medication-assisted treatment, this facility helps clients achieve and maintain their sobriety. Advocate Addiction Treatment Center has services for both male and female clients, as well as for the deaf and hard of hearing. The Gateway Foundation has centers throughout Illinois and provides residential inpatient, half-day outpatient, and full-day outpatient options to fit every schedule. Gateway helps clients get their lives back on track through customized treatment plans, that can include group and family counseling, recreation activities, and relapse prevention education. The Serenity House offers a multitude of treatment options for all ages and genders, including intensive outpatient, sober living/recovery homes, and residential care/halfway house programs. Serenity House “employs an integrative approach,” utilizing an evidence-based curriculum that includes acceptance commitment therapy, cognitive behavioral therapy, and dialectical behavioral therapy. At Positive Sobriety Institute, a holistic treatment approach is used throughout its inpatient detox, outpatient treatment, partial hospitalization, transitional living and continuing care programs. Along with medical care and supervision, Positive Sobriety Institute uses binaural beats and meditation as recovery tools. Positive Sobriety has a special focus on helping professionals who struggle with addiction, including pilots, athletes, nurses, lawyers, physicians, dentists, and executives. Stepping Stones provides services across the continuum of care, including intensive residential, intensive outpatient, and sober living recovery homes. This treatment center strives to be “person-centered in every way … the work done here is centered on you, designed by you, and accomplished by you. The focus is on your plans, your goals, and your recovery.” Stepping Stones also works with clients’ finances, and states that no one will ever be denied treatment due to inability to pay. At Banyan Treatment Center, the goal is to help patients achieve a “happy, healthy, and productive sober life through an array of treatment therapies.” This includes partial hospitalization, intensive outpatient, and alumni programs. Banyan focuses on providing consistency, accountability, responsibility, and the importance of integrating a 12-step program into patients’ daily lives. Timberline Knolls offers holistic, medically informed addiction care for women through expressive and experiential therapy. Twelve Step meetings are offered on and off site, and educational services are provided for school-age clients. The experienced staff helps clients adjust to recovery through services like medically managed detox and treatment for co-occurring disorders. To promote healing and connection to self, art therapy, dance therapy, empowerment group, movement group, and recreation are also offered at Timberline Knolls. When someone makes the brave decision to seek help for their drug or alcohol use, one of the first steps to recovery is the detoxification process, or “detox.” Detox occurs when the toxins from drug use begin to leave the body and the person enters acute withdrawal. Withdrawal can be painful, and — depending on the drugs being used — even dangerous. Withdrawing from opioids is extremely uncomfortable, but not typically hazardous to one’s health. However, withdrawing from alcohol, barbiturates, or benzodiazepines can be life-threatening, and these detoxes should occur under medical supervision. Many of the drug rehab centers throughout Illinois offer a medically supervised detox, which allows clients to pass through the withdrawal stage in a safe and supervised environment. Remember that although withdrawal and detox can be physically painful, it is only temporary and will pass. Once detoxed, individuals are usually in a much clearer state to begin the recovery process. With so many options for substance abuse treatment, attempting to choose the right facility can feel intimidating. Inpatient drug and alcohol rehab is one of the most common types, as it refers to a residential or overnight treatment center. Data indicates that long-term treatment that lasts at least three months, whether in inpatient or outpatient, can greatly improve an individual’s chance at recovery. Once admitted into a residential program, clients participate in an intake process with their treatment team. This helps the clinical staff determine the most beneficial course of treatment for each individual. When seeking treatment for addiction, the shortest programs often seem attractive, especially if you have family or professional commitments. Some people seeking treatment may be apprehensive to attend a residential treatment center, but the results can be rewarding. Inpatient treatment allows individuals to be immersed in the recovery process, resulting in a more intensive approach. Medical research tells us treatment lasting at least 90 days increases an individual’s chance of recovery, and inpatient treatment can be an excellent vehicle for achieving this. Haymarket Center in Chicago has multiple inpatient treatment approaches, including men’s, women’s, rapid stabilization, and a maternal addiction center. In addition, Haymarket offers medically monitored detox, outpatient services, and sober living homes for continuing care options. A 2014 survey from the National Alliance on Mental Illness states that 7.9 million people in the U.S. experience co-occurring disorders. Also known as dual diagnosis, a co-occurring disorder occurs when someone has a mental health issue coinciding with their substance use. Historically, there has been confusion about how to effectively treat those suffering from co-occurring disorders. Because of the complicated nature of a dual diagnosis — sometimes the mental health condition can appear and lead to substance use, other times the substance use manifests a mental health issue — it’s important that those with a co-occurring disorder receive specialized care. The SHARE (“Start Here Addiction Rehabilitation & Education”) Program, located in Hoffman Estates, has been committed to providing high-quality and effective care to those suffering from substance abuse and mental health issues since 1977. Through residential rehabilitation or intensive outpatient programs, clients are given access to services for therapeutic, family, and legal services. Being newly sober in an unfamiliar environment can feel overwhelming, and it’s imperative that each individual feels safe and respected in their treatment center. Many clients feel more comfortable in a gender-specific rehab facility (women-only or men-only), and others feel most at home in an LGBT-centered treatment center. Having the option of gender-specific treatment allows patients to take an active role in determining where they feel the most comfortable. New Hope in Chicago provides an LGBT+ addiction treatment program, “New Hope With Pride.” New Hope offers personalized, holistic treatment in an intimate setting, through partial hospitalization, intensive outpatient, and aftercare programming. New Hope With Pride is geared to include specific challenges and experiences unique to the LGBT+ community. Luxury rehab facilities offer many of the treatments available at traditional facilities, but have upscale accommodations and offer additional amenities, such as gourmet dining, exclusive fitness instruction, and a personal sober companion. While a luxury drug rehab in Illinois will typically have a higher cost range, this type of treatment center offers an elite level of care, as well as unique variations in treatments. Those attending a luxury treatment facility will experience therapies such as acupuncture, massage therapy, and yoga, and will be able to interact with top experts in the field. Located in the charming countryside of Gilman, Sunspire Health Heartland provides evidence-based treatment for addiction including medical detox, inpatient, and partial hospitalization care. Heartland clients participate in various forms of group and family counseling, expressive arts therapy, and coping skills education. Previously a spa retreat property, Heartland has a gym and a therapeutic community garden on site. When it comes to detoxing from a substance, the withdrawal symptoms can vary depending on the drug(s) used. Detox from alcohol, barbiturates, or benzodiazepines should be completed in a medically supervised setting, as withdrawal from these drugs can be dangerous. Medication-assisted treatment (MAT) can be a helpful asset to those who are detoxing, as its main goal is to reduce the symptoms associated with withdrawal. Opioid withdrawal can be extremely uncomfortable but is not usually dangerous. MAT can be a relapse-prevention tool, as it works to relieve symptoms of withdrawal and reduce cravings of the drug. For opioid addiction, buprenorphine medications like Suboxone are typically prescribed. Sometimes methadone will be prescribed, though it is much more easily abused than buprenorphine. Rosecrance Des Plaines, located in Des Plaines, offers medication-assisted treatment, along with partial hospitalization, outpatient, and nighttime outpatient programs. Rosecrance’s dedicated staff bases their care on evidence-based treatment therapies. Many people who suffer from substance use disorder encounter legal issues that require them to complete a court-order rehab program. Often times, an attorney may attempt to mitigate a legal charge, requesting that a treatment program is ordered instead of jail. For those who have a substance-related legal charge, attending a drug rehab in Illinois that is well-versed in judicial interactions can be beneficial. Treatment Centers of Illinois is licensed to provide court-mandated assessments and treatment services for adults convicted of an alcohol or drug-related offense. Treatment Centers has locations in Bolingbrook, Schamburg, Lombard, and Palatine, and uses an evidence-based treatment protocol to prevent reoffense and successfully move clients through the court system. Intensive outpatient programs (IOP) are considered to be as effective as inpatient treatment but are not as immersive as a residential program. IOP can be a positive option for those who have work or family commitments, and are unable to stay overnight for treatment. In IOP, clients typically meet three to five days per week, for at least three hours per day. These time slots are filled with individual and group therapies, and activities that reflect recovery principles. If you’re struggling with severe substance abuse issues or need a medically supervised detox, IOP may not be the best option. Consider a structured inpatient stay for the first part of your treatment, in order to set yourself up for the best possible outcomes. After an inpatient stay, or for those who are unable to attend residential treatment, IOPs and partial hospitalization programs (PHPs) can be helpful choices for continued care. Community recovery meetings are also considered outpatient treatment, and can serve as a cornerstone to building a new network in recovery. Hazelden Betty Ford Foundation has provided expert treatment at their Chicago location for more than 20 years. Hazelden offers multiple levels of outpatient rehab and sober living options for adults, as well as drug rehab services for adolescents. This rehab center comes highly rated, as 99% of former patients recommend seeking treatment here. Most treatment centers will work with potential clients, in order to make drug rehab financially possible. Using the option of public or private insurance can help to offset the financial cost. Public insurance like Medicaid is also accepted at some drug rehab centers, and most people are at least partially covered by government- or state-funded insurance vouchers. Additionally, scholarships and payment plans are sometimes accepted at treatment facilities across Illinois, in order to ensure those suffering are able to enter treatment as soon as possible. This diverse array of treatment options is reflective of Illinois’ hope for reversing addiction issues throughout the state. While the substance abuse numbers in Illinois are high, what’s even more staggering is how infrequently people seek treatment. Of the nearly 600,000 Illinois residents that struggle alcohol abuse, only 5 percent of those seek treatment each year. And although nearly 300,000 are dependent on or abuse drugs, a mere 11 percent of those get the help they need. Sometimes, this is due to misconceptions people have about finding effective and affordable treatment. Fortunately, Illinois has an option for everyone suffering from addiction, and the Prairie State offers help for their families as well. For more information on finding an addiction treatment center in Illinois, contact a treatment specialist today.